Hello and Happy Tuesday! Hope your weekend has been have as beautiful as ours was and that your week is off to a fabulous start! 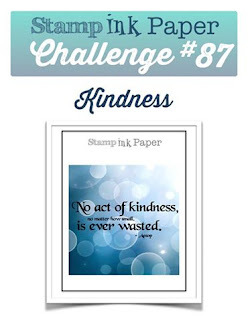 This week over at Stamp, Ink, Paper we have a Kindness Challenge! I really believe that the world could use a whole lot more of that, don't you? I was going through my stamps so see which ones I had with the word Kind or Kindness and I found that awesome stamp from Unity Stamp Co. called "Everyone You Meet" that I had bought and not used yet. Seriously .. this is just about my favorite saying and I was happy to finally ink it up! Do you ever make backgrounds and then not use them for their intended purpose? I do that a lot but I always save them and today I was able to use one of them on this card. I used Distress Inks to create it and since it's been a while since I made it, I don't remember the exact colors but I believe the Orange in it is Spiced Marmalade. I used a Mama Elephant Basic Creative Cuts die to diecut the background and heat embossed the fabulous Unity sentiment in black on it. I used the Stampin' Up! Botanical Builder Framelits to add the leaves and flowers. I wanted to keep this one fairly simple as it is really all about the awesome sentiment. Thanks Crystal! I Love making backgrounds.. It's always fun to get Inky! Really pretty, I need to make some back grounds. Secretly I'm trying to use up tons of paper first, then I can play around some more. Thank you Ginnie! 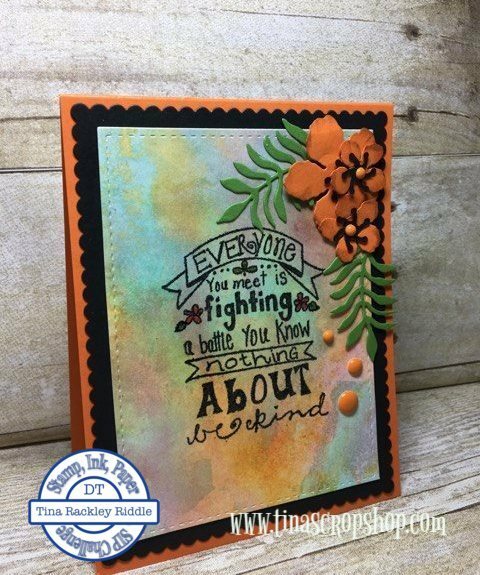 It is certainly fun to get a little inky! Maybe you'll have that paper used up soon! that's always been one of my favs from unity... amazing card! Aww.. thanks so much Eva. It's one of my Unity favs too!